Because we are not the original owners, it is impossible for us to know an item’s full history. We only weigh in on any visual defects and the functioning of an item to the best of our ability. It’s ALWAYS best to let the images be your guide. 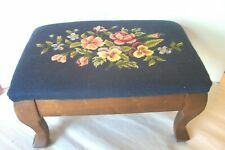 L. Hitchcock Stool Tripod Milking Seat Chair Ottoman Valued at $160 Stenciled Fruit Design Vintage 1970s Will be shipped either USPS, UPS, or Fed Ex depending on rates Item is Preowned and sold as is. It is in great condition with very few marks on it. Comes from smoke free home. Has original leather upholstery on it, which is worn out and tearing. Would need to be upholstered. Have a coffee table/ bench you planned to make?. A special new design inspired by the beaches of Laguna Beach, California. A modern rustic whale tail leg in a flat black finish. Raised gold gilt lettering. This is the real deal! Unbelievably heavy(over 30lbs), industrial stool. Contoured legs give a cool Mid Century/Modern look. Wheels turn nicely in all directions, raises/lowers, and also swivels. 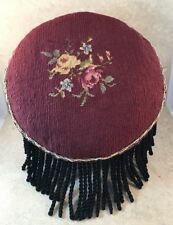 The cushion is in very good condition, a cream color that will match with all colors. Includes Matching Throw Pillows. Arm height: 29". Seat height: 16" ?. 62"w x 16"d x 29"h. We will obtain multiple quotes and pass the quotes and details along to you. Including Florida, Texas, Illinois and most all Eastern states. Three beautiful heavy built bar stools for one price. This is what gives it its character and confirms its age. And is being sold in “as is" condition. Overall a Beautiful Bench with great. This is what gives it its character and confirms its age. FREE Trial! Los Angeles Area (Santa Ana, CA 92705). Seat 15 1/2"Round. Base 23"Round. 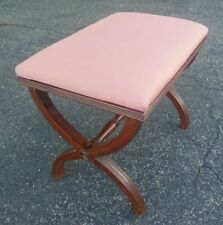 Footrest 12"H. Words used such as Original, or reproduction, or the style of, or made by. And including a variety of reason. Unique Bench in Great Condition. Solid and Firm. Words used such as Original, or reproduction, or the style of, or made by. And including a variety of reason. Wear is usual for its age. This is what gives it it's character and confirms its age.